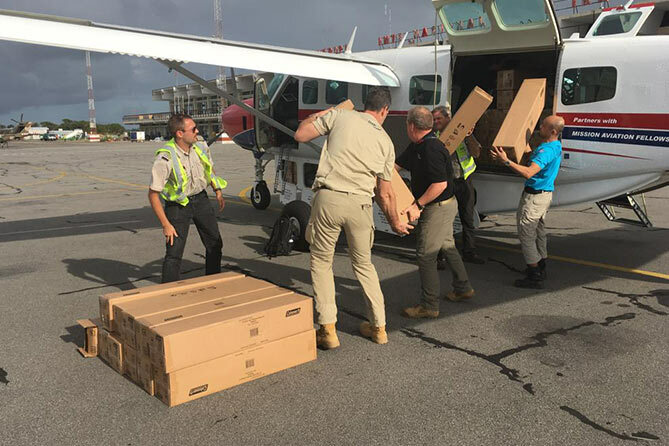 The MAF team is busy conducting survey flights for the many NGOs and agencies that are now arriving in Beira to provide aid, such as UNHAS, World Vision, International Humanitarian Partnership (IHP), Samaritan’s Purse, World Food Program, and Red Cross. MAF continues to work closely with Mercy Air to reach as many people as possible by air using both MAF’s Cessna 208 and Mercy Air’s helicopter. This morning they were able to fly some of the team with Samaritan’s Purse to Guara Guara for a survey to set up a medial base. Another 27 food airdrops have been flown with the helicopter to reach pockets of people in the Tica area, delivering 400kg of high energy biscuits to those in desperate need. To date, MAF has flown 31 flights in the C208, carrying 107 passengers. In conjunction with Mercy Air, we have helped with 22 helicopter flights, carrying 67 passengers. As of today, 13,198 kilograms of cargo has been transported to deliver emergency items like food, tents and family shelter kits. • Cholera and other diseases are starting to be a concern. Please pray that the people in the area will be protected. • Pray that people will be able to plant soon to prevent long-term food insecurity. • Pray that people won’t have to be long in the IDP camps but will be able to return to their homes soon. • Pray for the fortitude of our team, and that those they meet will see Jesus in them. Story and photos by MAF and Mercy Air. 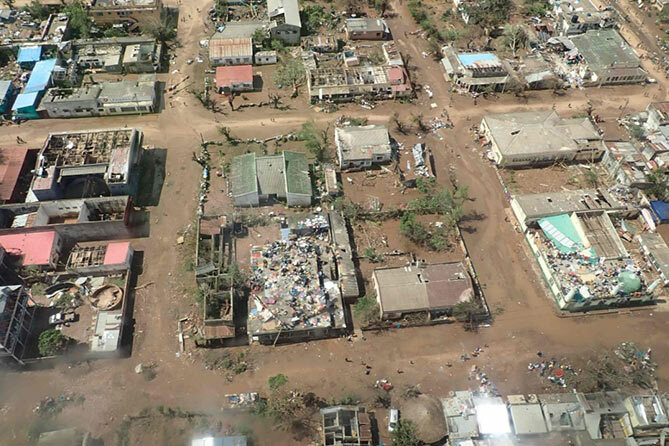 Give to the Mozambique Cyclone relief fund. Whether it’s transporting relief supplies to a refugee camp, or flying doctors to a remote village, MAF’s “Wings of Love” bring more than just tools and supplies to a hurting world - we bring the Gospel of God’s love in a tangible way. Mission Aviation Fellowship of Canada is a member of the Canadian Council of Christian Charities, and is a registered Canadian charity (12994 2561 RR0001) able to issue receipts for income tax purposes. MAF Canada has a formal alliance with MAF-US, and is an associate member of MAF International. Mission Aviation Fellowship of Canada is a registered Canadian charity (Registration # 12994 2561 RR0001) and is able to issue receipts for income tax purposes. Each gift allocated toward an MAF board-approved program will be used as allocated with the understanding that when any given need has been met, additional allocated gifts will be used where most needed. Copyright 2019, Mission Aviation Fellowship of Canada | All Rights Reserved.